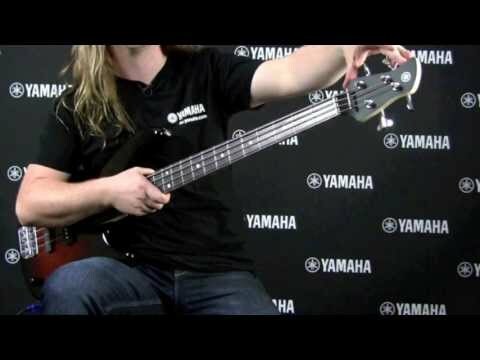 The Yamaha TRBX174 Electric Bass Guitar offers a comfortable playing feel, versatile pickups with a bouncy energy, built to the same high standard of quality that we've come to expect from the musical instrument manufacturing giant. Whether you're just starting out your career or are a seasoned pro, the TRBX174 is suited to all playing abilities and musical styles. The Yamaha TRBX174 body is built using alder, a tonewood that is widely adopted by guitar manufacturers thanks to its lightweight feel and smooth timbre - a winning combination. The body is shaped with sweeping contours that allows the bass to sit snugly against your body, whilst the deep double-cutaway profile gives greater access the upper frets. Weight across the body and neck is distributed perfectly, making the TRBX174 very comfortable to wield. The Yamaha TRBX174 is equipped with a precision fitted bolt-on maple neck, which provides a strong, supportive and fast-playing feel. The maple lifts notes by articulating mid to high frequencies with a crisp clarity, making the most of the alder's flat frequency response. Paired with the neck is a sonokelin fingerboard, which is home to 24 frets that are adorned with dot position inlays to guide your way with ease. The fingerboard's 10-inch radius makes it very easy to execute smooth string bends, perform slap bass lines, and noodle to your heart's content. The headstock is home to covered tuning machines that uphold tuning integrity with precision, whilst the vintage-style bridge and tailpiece work together harmoniously, anchoring strings to optimise intonation. Providing clear, defined and powerful tones are the split single-coil middle pickup, and single-coil bridge pickup. The pickups draw out the crisp timbre of the alder and maple sweetly, producing a wide range of tones from saturated warmth to sparkling highs with plenty of snap. Each pickup is equipped with an independent volume control, whilst a master tone control allows you attenuate the EQ with ease. The Yamaha TRBX174 Electric Bass Guitar offers superb build quality and durability, making it a great model for practising and gigging with. The tonal versatility on offer is generous and adaptable to all musical styles with ease thanks to the simplified control layout.